I’m sure that you can all imagine that I spend a lot of my day listening to people moaning about their lives. There are countless people who feel sorry for themselves and you don’t need to be a therapist to be exposed to this – just spend some time on Facebook or in the break room at work, or even sitting with your family members and you will be confronted by people who complain incessantly. The sad thing is that most of the people doing the complaining have no idea how blessed they are or how much good they actually have in their lives. I am treating a lady at the moment who developed a meningitis infection as a result of HIV which left her blind. After surviving that ordeal, she decided to really start living her life – she has learned how to swim, gained new skills and is always on a mission to learn new things and embrace the wonder around her. Part of that journey is attending therapy. I am so inspired my her story and her attitude. To top it off, I watched a documentary about Nick Vujicic today and I think that it should be compulsory for everyone to watch or read his story. How does somebody with so many limitations live a life with so much positivity and enthusiasm? And how do people who have so much spend so much energy on negativity and moaning? I think that Depression, Anxiety and Bipolar Mood Disorder are some of the most difficult, misunderstood illnesses to have. And while I never expect any of my clients to be jumping up and down with the joys of life and constantly counting their blessings, I do ask them to try to focus on what they have rather than what they don’t. I ask them to think about what they think their mission is in life and what they can learn through their own challenges. You are so wonderful, so blessed and so unique. You could really give so much to yourself and the world if you just allow yourself do it. It doesn’t matter how much negative feedback you get from other sources. The most destructive type of negative feedback is from your own negative self talk. That little (although it is sometimes deafeningly loud) voice of doubt. It is that voice within you that is constantly telling you what you can’t do rather than celebrating your achievements. It warns you that you are going to fail, or worse, that you are already a failure. And you let that stop you from being awesome and reaching amazing potential. I have never really found a technique that can absolutely shut off that negative talk and replace it with positive. Mainly because I think that for some bizarre reason, we are almost programmed to think the worst. But there are definitely things that you can do to encourage positive self talk. It is not about shouting from the rooftops to the world about how wonderful you are but rather, quietly reassuring yourself that you can do it and that you are worthy of doing it. 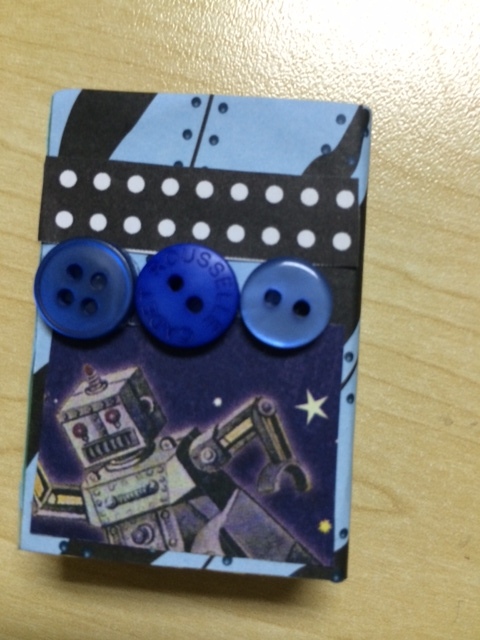 A few weeks ago, I tried a craft with my therapy group where we made positive self talk boxes. It was so easy yet so effective. Both as an enjoyable and simple craft to make with beautiful results but also an effective end product. Get an empty matchbox and decorate it on the inside and the outside with stickers, paper, ribbon, buttons, feathers, glitter and any other item that you love. 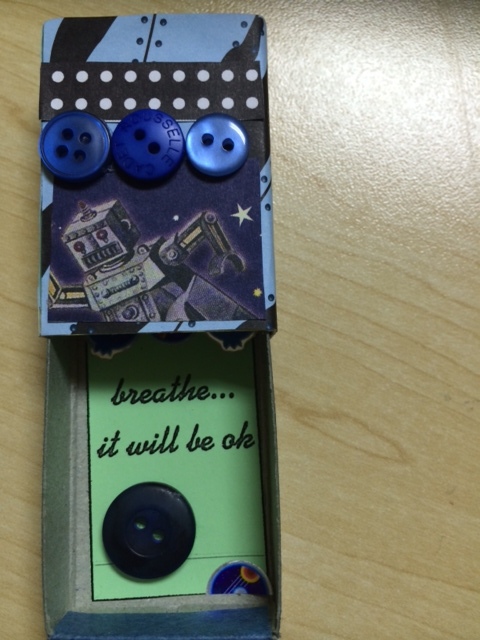 Write or print a positive message for yourself and stick it inside the box. Once it is dry, put it in your bag or your pocket. Keep it in your desk drawer or next to your computer. Everytime you need a reminder of something positive, just open the box. Take a deep breath and affirm the positive message inside. Now, start to live it!